Blog written by Pete Shelton, IFPRI. Originally posted on IFPRI.org. Getting the right nutrition in the period between a child’s conception and his or her second birthday−the so-called 1,000 day window−can have profound impacts on the child’s ability to grow, learn, and become a productive member of society. A growing body of research demonstrates that the opposite is also true: malnutrition early in life can cause irreversible damage to children’s cognitive and physical development, leading to diminished learning capacity, poor academic performance, lower incomes, and the increased prevalence of chronic disease. Limited access to diverse, nourishing foods, lack of knowledge on optimal practices, and low household incomes are all leading contributors to early childhood malnutrition. Yet research also shows that many of these may be addressed by combining nutrition-sensitive approaches with social and behavior change communication (SBCC), the latter being the theme of three-day conference in Addis Ababa this week. Nutrition-sensitive approaches include a wide range of interventions from other related sectors−such as agriculture, social protection, education, and women’s empowerment−that are shown to positively impact nutritional outcomes among targeted beneficiaries. A series of IFPRI-led studies are exploring and documenting these so-called impact pathways, particularly as they relate toward achieving better nutritional outcomes during the 1,000 day window through targeting new and expectant mothers. In Haiti, researchers examined the relationship between community health workers’ knowledge and knowledge sharing efficacy with mothers’ knowledge as part of an integrated infant and young child feeding program. The program combined food supplementation with behavior change communication practices, and researchers found that outcomes are conditional on both frontline workers’ knowledge and knowledge-sharing efficacy, underscoring the need to focus on both areas in the training of community health personnel. 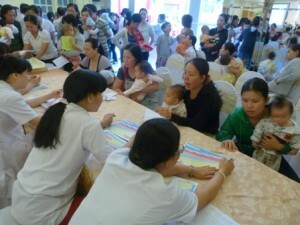 In Vietnam, researchers evaluated the impact of a five-year initiative that aimed to promote exclusive breastfeeding by combining capacity strengthening among health care workers with expanded services to new and expectant mothers, community-support groups, and a mass media campaign geared toward new and expectant mothers. The program aimed to double rates of exclusive breastfeeding among beneficiaries; in fact, it achieved this and then some, as rates increased from 19 percent to 58 percent between 2010 and 2014. In Burkina Faso, researchers evaluated a two-year enhanced-homestead food production program implemented by Hellen Keller International (HKI) using a cluster-randomized control study design and two rounds of process evaluation. The program combined giving mothers with young children (3-12 months old) small productive assets, such as seeds and small tools, with knowledge sharing about best practices in agriculture, health, hygiene, and nutrition. Key findings from this study included a 15 percentage point reduction in the prevalence of anemia among infants aged 3-6 months, a 9 percentage point reduction in child wasting, and a 10-16 percentage point reduction in diarrhea, a key contributor to wasting. In addition to the studies highlighted above, several more IFPRI studies directly examining the relationship between SBCC and nutritional outcomes are ongoing, with results to be published in the coming months and years. Moreover, many other IFPRI-led programs and projects include key behavior change communication elements, such as HarvestPlus’ promotion of biofortified crops through integrated nutrition education campaigns and community plantings, radio programs, and even concerts and videos by pop music stars. Across all of the programs under evaluation, one research finding remained constant: SBCC is a key element for improving the impact of nutrition-sensitive impacts. Yet researchers often tasked with examining the effectiveness of two-year pilot programs often were left hoping such programs would not only integrate key researcher findings to improve overall program effectiveness but also that they would be funded beyond their pilot phase to begin with. Two reasons for optimism from this particular study are: first, the program did have a positive impact on children’s health and nutrition outcomes; and second, Hellen Keller International (HKI) already has adopted several of the recommendations for boosting the program’s potential to improve children’s health and nutrition outcomes proposed by Olney and her colleagues based on their research findings. According to Olney, IFPRI is now working with HKI project staff on the ground to evaluate the impact of these changes in what they hope will be another step toward not only further improving nutritional outcomes but also contributing to better program design and implementation in the future. *Additional resources on behavior change research, related publications, and a video on the Burkina Faso study are all available on the original blogpost.